Do you just want to keep doing the same old thing and getting the same old results? If so, The Key to Everything is not for you. Are you ready to do something radically different in order to bring about positive change? Learn the 3 key steps you need to achieve all of your goals. You can use the power of your mind to transform your life. Click here to download The Key to Everything today. 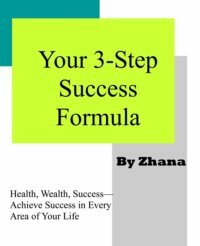 Click here to download your free chapter on Achieving Success, which contains the 3-Step Success Formula.